In this March 8, 2017, file photo, Maine Gov. Paul LePage speaks at a town hall meeting in Yarmouth, Maine. The governor says he doesn't plan to endorse anyone in the upcoming gubernatorial election. Gov. 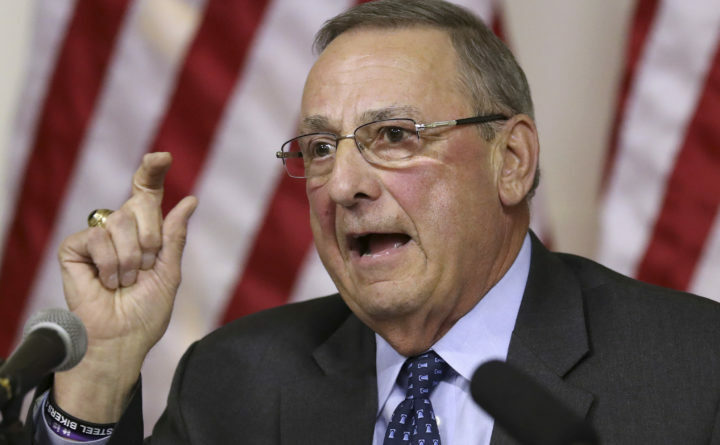 Paul LePage said Tuesday that he has no plans to endorse any of the candidates vying to replace him when his term expires next year, but he said he wouldn’t endorse a top Republican legislator with whom he has feuded. The Republican governor was asked on Maine Public’s “Maine Calling” if he will back Republican candidate and businessman Shawn Moody of Gorham, who has hired LePage adviser Brent Littlefield and Lauren LePage, the governor’s daughter. He responded that he’s “not endorsing Shawn Moody or any” of the five Republican candidates, but that he’s “not going to endorse any Democrat that I’ve seen so far” or Maine Senate President Mike Thibodeau, R-Winterport. LePage’s feud with Thibodeau began in 2015 when a political organization aligned with the governor and run by Lauren LePage hit Thibodeau’s district with robocalls criticizing him for negotiating with the Democratic-controlled House to create the state’s two-year budget. Thibodeau was open to a legislative censure of LePage in 2016 after the governor called a Democratic lawmaker a “socialist c—sucker” in a voicemail. He and LePage were also on different sides of the budget battle that forced the 2017 government shutdown.